Speaking during a free glaucoma screening for 10, 000 Nigerians, tagged: ’Kick Out Glaucoma Now’, an initiative of Me Cure Eye Centre, a subsidiary of Me Cure Healthcare Limited,”, Alabi said: a quite number of working age group are coming down with advanced glaucoma. He charged Nigerians to evaluate their eyes regularly to prevent avoidable blindness. 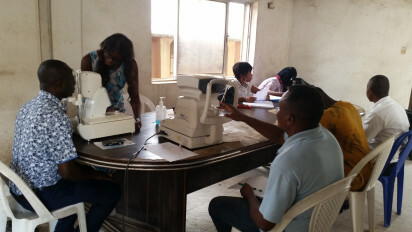 Abia indigenes under-going screening during the free eye-clinic organised in Lagos, by the Abia State Towns Union Association, ASTUA in collaboration with the Ophthalmology unit of Me-Cure Healthcare Limited, Weekend. On the free screening which spans February – March 2019, Alabi, who is the Chief Operating Officer of the Eye Centre, described glaucoma as a disease of public health importance, saying “it formed about 80 percent of the hospital’s patients over the period of six years it has existed. “Since the inception of this eye centre, we’ve noticed very high incidence of glaucoma. Currently, about 80 percent of our out patients have glaucoma. So glaucoma is more or less a disease of public health importance. However, unfortunately, not many people know about it. So we believe that this is an opportunity to create that public awareness. “The disease itself is not an issue; the issue is detecting it early. If you detect glaucoma early, then we can prevent blindness. We know glaucoma is an irreversible disease. Blindness that ensued from glaucoma cannot be reversed. We have like 60 variants of glaucoma but the most common is the primary type and when we say primary we can’t say this is the cause. “For primary glaucoma, the basic risk factors are divided into modifiable and non modifiable factors. Unfortunately, majority of the risk factors are under the non-modifiable,” he said. He listed them as age, race, family history, short sightedness whereas modifiable factor is when the pressure of the eye becomes very high. On his part, Head, Strategies and Commercial Services of the Centre, Dr Kunle Megbuwawon said Me Cure, as a socially responsible organisation, initiated the free screening programme to increase the lifespan of Nigerians by doing more of preventive health. He said with early detection, there are treatments options that can help reduce loss of vision and slow down the progress of glaucoma. “Nigerians must be encouraged to be more conscious and proactive about their eye health by going for periodic eye screening and undergoing proper treatment when they have issues.” he stated.